Passengers of the TUI cruise liner Mein Schiff 3 can experience marine life at sea: the world’s first maritime museum at sea on 300 square metres. The interactive permanent exhibition provides insight into the history of seafaring and shows how the seas are researched and explored today. A continuous wall cabinet frames the whole exhibition space. The exhibits, compiled to emphasise the scientific nature of the exhibition, cover the subject areas ‘experiencing the sea’ and ‘exploring the sea’. Several media stations are designed to communicate the general idea of exploration and provide interactive access to the contents of the ‘marine life’ exhibition. 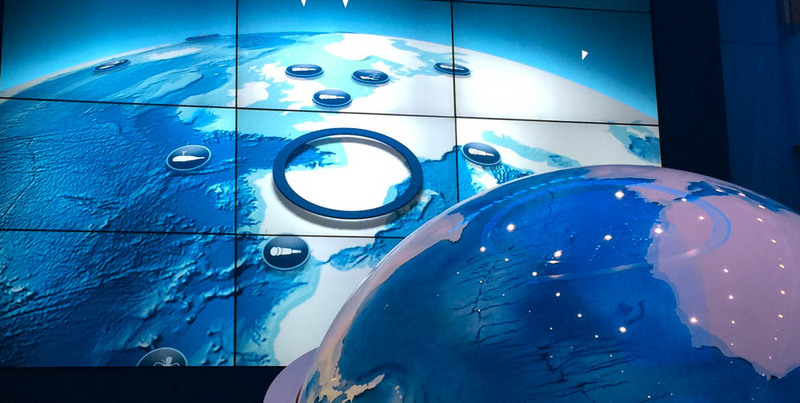 Visitors can move the large and prominently positioned ‘explorer globe’ with a diameter of 160 cm like a trackball and control an animation on the monitor wall this way. While the ‘virtual bridge’ gives insight into the work of the captain, the ‘marine cinema’ showcases different films and documentaries about the fascinating and generally hidden underwater world. An interactive ‘researcher table’ enables visitors to discover how the seas and marine life are scientifically fathomed.